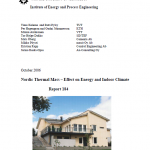 The purpose of this article is to analyze the effects of thermal mass on heating and cooling energy in Nordic climate and for modern, well-insulated Nordic buildings. The effect of thermal mass is analyzed by calculations made by seven researchers and by seven different calculation programs. Six of these programs are simulation programs (Consolis Energy, IDA-ICE, SciaQPro, TASE, VIP, VTT House model) and one monthly energy balance method (maxit energy) based on the standard EN 832, which is the predecessor of ISO DIS 13790. It is purpose to evaluate the reliability of the monthly energy calculation method and especially its gain utilization factor compared with the simulation programs. In addition some sensitivity analysis concerning e.g., the effects of the size and the orientation of windows and the weather data on the energy consumption are made. 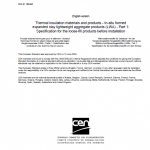 The results show that the simplified standard methods of EN 832 and of ISO DIS 13790 generally give accurate results in calculating the annual heating energy, e.g., in the context of energy design and energy certification. However, the gain utilization factor of these standards is too low for very light buildings having no massive surfaces resulting in a too high energy consumption. The study shows, that the differences in input data cause often greater differences in calculation results than the differences between various calculation and simulation methods. EN 1996 Eurocode 6 applies to the design of buildings and other civil engineering works, or parts thereof, in unreinforced, reinforced, prestressed and confined masonry. The execution is covered to the extent that is necessary to indicate the quality of the construction materials and products that should be used and the standard of workmanship on site needed to comply with the assumptions made in the design rules. This European Standard applies to prefabricated walls, made of normal weight or lightweight concrete with dense structure. Also fibre reinforced concrete (steel, polymer or other fibres covered by European standards) may be used. These wall elements may have external wall functions (see 3.11) or not, have facing functions (see 3.12) or not or have a combination of these functions. External wall functions could be: - thermal insulation (see 3.11.1); - sound insulation (see 3.11.2); - hygrometric control (see 3.11.3); or a combination of these. They may be plain, reinforced or prestressed. They may be loadbearing or not. These include: - solid walls; - composite walls; - sandwich walls; - lightened walls; - claddings. The wall element may also work as a column or beam. EN 1992 Eurocode 2 applies to the design of buildings and other civil engineering works in plain, reinforced and prestressed concrete. It complies with the principles and requirements for the safety and serviceability of structures, the basis of their design and verification that are given in EN 1990: Basis of structural design. EN Eurocode 2 is concerned with the requirements for resistance, serviceability, durability and fire resistance of concrete structures. This European Standard is for prefabricated components of lightweight aggregate concrete (LAC) with open structure and with structural or non-structural reinforcement intended to be used in building construction a) for structural elements: - loadbearing wall components (solid, hollow core or multilayer); - retaining wall components (solid) with or without surcharge loading; - roof components (solid, hollow core or multilayer); - floor components (solid, hollow core or multilayer); - linear components (beams or piers). b) for non-structural elements: - non-loadbearing wall components (e.g. for partition walls); - cladding components (without fixtures) intended to be used for external facades of buildings; - small box culverts used to form channels for the enclosure of services; - components for noise barriers. NOTE 1 In addition to their loadbearing and encasing function, components can also be used to provide fire resistance, sound insulation and thermal insulation. Components covered by this European Standard are only intended to be subjected to predominantly non-dynamic actions, unless special measures are introduced in the relevant clauses of this European Standard. The term "reinforced" relates to reinforcement used for both structural and non-structural purposes. This European Standard does not cover: - rules for the application of these components in structures; - joints (except their strength); - fixtures; - finishes for external components, such as tiling. NOTE 2 LAC components can be used in noise barriers if they are designed to fulfil also the requirements of EN 14388. 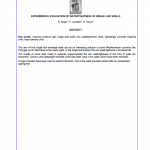 This European Standard specifies the properties of Lightweight Aggregates (LWA) and fillers derived thereof obtained by processing natural or manufactured materials and mixtures of these aggregates for concrete, mortar and grout, bituminous mixtures and surface treatments and for unbound and hydraulically bound applications in construction works. This European Standard covers LWA of mineral origin having particle densities not exceeding 2000 kg/m3 (2,000 Mg/m3) or loose bulk densities not exceeding 1200 kg/m3 (1,200 Mg/m3) including: a) natural LWA; b) LWA manufactured from natural materials; c) LWA manufactured from by-products of industrial processes or from recycled source materials; d) LWA as by-products of industrial processes. A list of source materials and specific materials, which are within the scope of this standard, is given in Annex A (normative). NOTE Recycled aggregates from construction and demolition waste and Municipal Solid Waste Incinerator Bottom Ash (MIBA) are covered by standards EN 12620, EN 13043, EN 13139 and EN 13242. Some LWA for specific applications are covered in separate European product standards (Annex B, normative). The requirements specified in this standard may not be equally relevant to all types of LWA. For particular applications, the requirements and tolerances can be adapted for the end use. 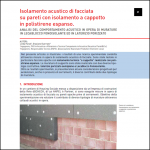 This document is born from the partnership with University of Ferrara and University of Florence and focuses on the behaviour of Expanded Clay blocks for soundproofing party walls in residential buildings. Since 2000, there have been realized about 120 tests of apparent sound reduction index (R’W) on expanded clay party walls in residential buildings. Aim of these measurements was to verify the reliable soundproofing of these walls that fully meets Italian regulatory requirements. These walls are 25 and 30 cm thick, laid with traditional mortar and with plaster on both sides. Excellent results show the reliability of this kind of walls: in 98% of cases the apparent sound reduction index R’W is over 50 dB as requested by Italian regulation for residential buildings. The use of thick single leaf envelope walls can be an interesting solution in some Mediterranean countries like Portugal, as an alternative to the cavity walls. In the single leaf solution the rain watertightness is fundamental. The results of some tests made to evaluate experimentally the rain watertightness of this kind of walls are presented. Ceramic and lightweight concrete units have been used in the walls, which have been rendered. A large chamber have been used to perform the tests. One of the walls has been tested after an accelerated ageing test. The document was born from a research on facade sound insulation in external walls with ETICS in expanded polystyrene (EPS) to compare the behaviour of two different kind of masonry: expanded clay blocks wall (30 cm thick) and bricks wall (30 cm thick). On-site tests are made with the same surrounding conditions (shape, geometry, exposure, …) and the same ETICS in EPS. This research shows how external walls in expanded clay blocks have a better sound insulation in facades (difference about 3 dB on-site) than the same wall with bricks. This article also shows some design considerations to highlight the different contribution of the two masonry also with doors and windows. The use of infilling masonry units made with expanded clay lightweight concrete is increasing in Portugal. There are not too many studies concerning these specific types of concrete to be used in vibrocompressor system productions. 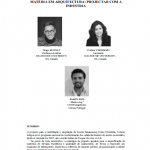 In this paper the results of an experimental study are presented for different lightweight concrete masonry products, with samples obtained on real production conditions. For concrete densities between 850 kg/m3 and 1450 kg/m3, different properties of these types of concrete, like compression and tension strength, modulus of elasticity, shrinkage, water absorption by capillarity and immersion and thermal conductivity are presented and related. A mix design method for these concretes, developed for factories of precast products of lightweight concrete, that allows to define mix proportion and related properties is presented too. The project for the rehabilitation and expansion of the School Braamcamp Freire (Pontinha, Lisboa) is part of the national program to modernize High Schools, having started in 2007 under the safeguard action of Parque Escolar, EPE From the construction point of view, the design strategy pointed to the specification of high strength and quality finishing materials, in order to meet the performance requirements implied by the public character of buildings, providing comfort of use and ensuring low maintenance costs. As a result of close collaboration with industry, acoustical block Soundcomfort, existing in standardized production, it was modified in size, the type of particle size and color of their households, and remained its internal geometry - subordinate status to its performance Acoustic. By optimizing these parameters, the new block was applied in different areas and contexts of Braamcamp Freire School, satisfying the sound insulation requirements, adapting to the dimensional constraints of existing buildings and adapting to the public character of spaces, demanding a comfortable surface finish to the touch. The importance of the thermal performance of buildings has increased due to e.g. the implementation of the Energy Performance Directive of Buildings. In this context energy certification systems of buildings will also require the calculation of energy consumption of buildings in future. The fact that the thermal mass of buildings decreases total energy consumption, is well known, but the amount of this effect depends on many assumptions and values used in the calculations. During this project it has been collected the best available Nordic knowledge around the table to develop a Nordic consensus about the questions studied. It’s important that we have in Nordic countries enough knowledge to be in the forefront in order to get our views included in the European standardisation. The thermal mass of buildings has a clearly positive effect on energy consumption and indoor climate. However, the buildings have to be designed cleverly to be capable to utilise possibilities for smaller energy consumption and better indoor climate. This project was a co-operation project with research institutes of Nordic countries. 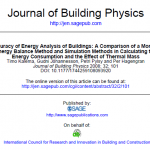 There were used six different energy calculation software’s, whose results were compared with each other and with one program based on the European standard EN 13790, Thermal performance of buildings - Calculation of energy use for space heating and cooling. The main author of the report and the collector of the results was Timo Kalema from Tampere University of Technology. This document is born from the partnership with EUCENTRE of Pavia (European Centre for Training and Research in Earthquake Engineering) and focuses on seismic analysis of some types of residential buildings with load-bearing masonry in expanded clay blocks. 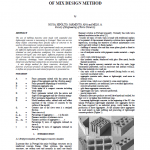 Here are evaluated the performances given from expanded clay blocks solutions with two methods of analysis (linear and non – linear static methods). The document also focuses on the comparison between ordinary load bearing masonry and reinforced load bearing masonry.